As I did my Sunday morning sorting and saving of photos, I found a photo I had missed in my previous editing. 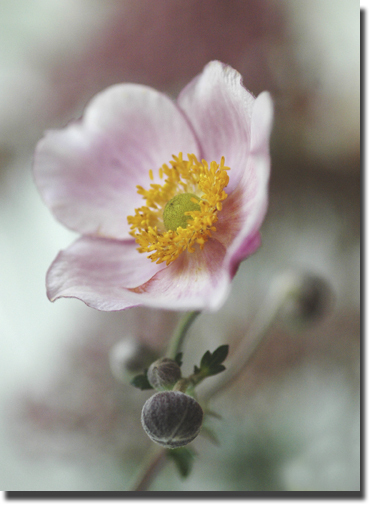 It is a Chinese Anemone on display at a local flower show. The show is inside the Boone Mall underneath the skylights of center court. As I recall, there wasn't direct sunlight, but more of a flat haze. I used my Nikon 105mm macro lens. The camera's aperature was f4 and I handheld it at a shutter speed of 1/30 second. Except for a normal curve adjustment and sharpening in Photoshop (I don't like the camera to sharpen my images), this is a straight forward photo. I find using a limited depth of field aids in not only ridding the image of background clutter, but adds a painterly effect.